We (not the royal we, but the people I work with) have recently been through an office move. Lots of stickers on everything, drawers packed into boxes, shelves reassigned and a general state of upheaval. Whilst the office was being transformed I decided to employ by best attempts at channeling Sherlock Holmes in the search for a secret society I often hear reference to and have never found – they call themselves ‘the business’. Having worked in my current organisation for a little over 15 months I have never met anyone who claims to know or be part of ‘the business’ but yet some must be because something big enough and influential enough to block every kind of initiative and proposal, to ignore such great ideas and to general overlook everyone MUST have some members. Maybe it is so secret that people can’t even admit to being part of it? Sorry? Everyone is WHAT? Everyone in the organisation is part of ‘the business’? This can’t be true! ‘The business’ ignores everything and everyone, doesn’t it? OK, odd one-sided conversations aside, I often hear ‘the business’ being blamed for a lot of things and whilst I understand at times it’s difficult to influence a big complex organisation maybe, just maybe it’s not about one attempt and then futile resignation (possibly in both senses of the word). Surely if governments can be influenced by public opinion then organisations can be influenced by stakeholders – and if you don’t think you’re a stakeholder in your organisation then think again! Yesterday I mentioned watching a TEDx video of a session delivered by Professor Lynda Gratton of the London Business School. If you want to watch it just flick back one post. I talked about it starting two streams of thought and here goes with the second. Her thoughts caused me to reflect on my own experiences with social media and networking both online and in-person but also how we as HR professionals have such an important role to play in helping people and organisations in getting over their barriers to move from the left of those pairs to the right. For me personally the last 4 years have been transformational in the way I engage with people generally but more specifically now my network has grown and keeps growing. Whilst social media has played a huge part in that the really great stuff has been when those online people have become real and have been part of a conversation whether it be just for fun or about something more grow’d up. Yes, social media was part of it but the great stuff was real! The real shift that will need support I believe is going to be helping individuals within organisations to collaborate both internally and externally. Helping them overcome the barriers – internally power and politics and externally the competitive edge and business confidentiality, to understand how people and organisations can and on occasion MUST work together. This is not just for the ‘right on’ reason of being more collaborative but the absolute necessity of survival. Professor Gratton talks about recent changes in technology as the biggest shift ever seen (she admits to it being bigger than the industrial revolution her previously highest ranked shift) and my personal opinion is it’s only just begun. Coming back to the thoughts of yesterday you can either walk into blindfolded or have a carefully crafted future but whichever you do people’s capability to adapt and deal with what’s coming has to be key to the people professionals. Not just for the good looks, creative talent and his very attractive wife but for the fact that he worked on Madison Avenue in the 60s. It looks such fun – drinking, smoking, lots of socialising and even someone who takes your hat and coat in the morning to hang them up. OK not so much the hat but you get my point. If I think back to when I was kid, my Dad worked in a senior purchasing role in Civil Engineering. He went to every sporting occasion he wanted (and saw Gareth Edwards go over in the corner in the mud), fought off gifts at Christmas and his expense account was a thing of beauty. Not a code of conduct or an ethical sourcing policy in sight! I have come to conclusion I live in the wrong era! These random thoughts were pinging around my head earlier this week but were brought into sharp relief by a blog post written by Gareth Jones. It’s called ‘Conversation is the new currency’ and it makes some impassioned and fairly bold assertions about the value of conversation to organisations. I am fortunate enough to know Gareth and his commitment to this topic is unwavering even though I on occasion drive him nuts with my requests for evidence or case studies. Having read through and reflected on his post I have come to conclusion that I firmly disagree with Gareth (and not just on the fact that conversation is potentially the biggest source of business value) but specifically on it being the new currency. It is my belief (and I have no evidence or case studies either) that conversation is the oldest currency in organisations. What we are trying to do now is replicate something that used to exist in the past but has been lost in the waves of change, productivity improvements, downsizing, technology, expansion, relocation and globalisation. If we go back to my Dad, he regularly went to the pub with his colleagues and stood around and chatted – not because they were on a corporate retreat, a team building day or because it was being paid for by the business – they just went to the pub. Business networking was not a load of uptight people exchanging business cards (or adding each other to Linkedin) it was Round Table which entailed a good deal of partying, dancing, travelling and some significant community and charity work. His dinner suit didn’t only come out for awards dinners and the people he did business and worked with became his friends (and one of them my godfather). I do agree with Gareth that we need to focus on communication not on engagement. In the same way that Chris Shambrook talked about the need to focus on performance and not result. We need to consider how people are going to feel connected to the people they work with not just get a score of how many of them do. However you go about achieving that I think it’s worth bearing in mind that all we are doing with social media (and other solutions) is trying to replicate the oldest of situations – a group of people standing around talking. 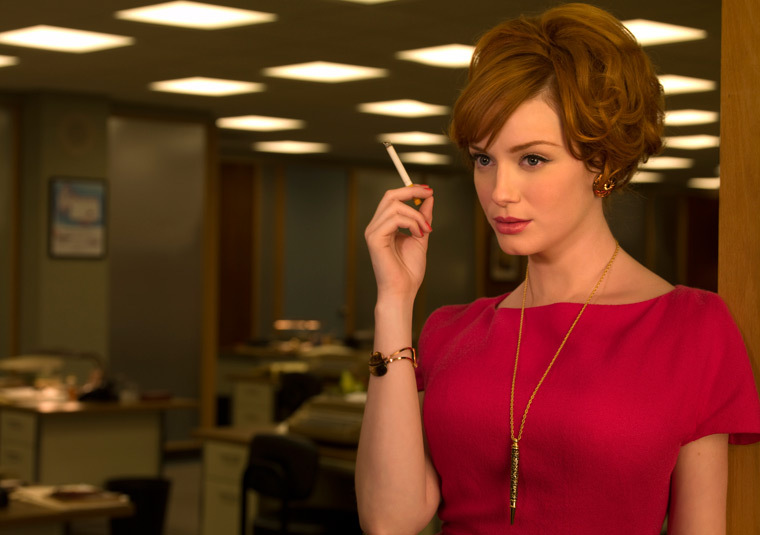 As for me, I’m off to dream of being Don Draper…or maybe just to dream of Joan. Have a great Thursday everyone! As part of a variety of workshops and team days I have regularly asked the question “what team are you in?” The answers are diverse and range from “team <individual’s name>” to their functional team to the particular country team or the entire organisation. It’s an interesting question and to me speaks to the individual’s perception of their role, maybe their motivation, their esteem in the organisation and what network they see themselves as part of. Identity is one of those things that is present on all parts of our lives. Think back to the school yard – everyone was in gangs that were identified by a characteristic usually involving sport or social status (or is it technology now?). When you start working there are labels like the new starter, the graduate, the temp. As much as people seem to like labelling others (i.e. she’s an employee of X) it is more pertinent to the individual as to what label they choose to accept – how and what they identify with. In his 2001 book Haslam describes organisational identity as akin to a psychological bond between the employer and the employee and Ashforth & Mael describe it as “the perception of oneness with or belonginess to the organization”. Haslam goes on to suggest that individuals who identify with their organisations see themselves as members and see the organisations values as aligned to their own either on a conscious cognitive level or a more emotional “pride” level. Employees who identify with their organisations will work longer for the greater good, often involving individual sacrifice and are more intrinsically motivated to deliver increased performance. Different organisations treat this topic very differently. From recruitment and induction through to values workshops, employee surveys, town hall meetings etc etc etc, how organisations try to manage this and measure it is a topic much bigger than a) this post and b) my interest currently, but it does seem to me that at times we are skirting around the central tenant and looking at the superficial, do people actually feel like they belong to your organisation or is it just a transactional relationship? I was having a conversation with a pal of mine at the weekend. She is an executive in a fairly large business and was talking about the commercial challenges they are facing at the moment. She went on to say that the senior team (of which she is part) have spent 9 months searching for the silver bullet and have finally realised it’s not one thing but a series of smaller things combined that will change their fortunes. I am not suggesting for a moment that the topic of organisational identity is a) as straightforward as presented here or b) a silver bullet for organisations BUT it needs to be part of the discussion. The next time you have the opportunity ask some people which team they are in and why they think that, I’m not suggesting it will immediately change your fortunes but I would lay a sizeable bet it will be an interesting conversation. P.S. What team are you in?? ?